The Fire Side: Comfort and ease. I like nothing better than coming home from work and relaxing. I don't want to spend lots of time doing stuff when I get home; home time is for relaxing, spending time with family and winding down after a hectic day. And that includes food and cooking. I love cooking, but the last thing I want to do after a long day at work is slave away for ages over a meal - I want something nice, simple and easy. The potatoes, onion and peas were things we had in already. 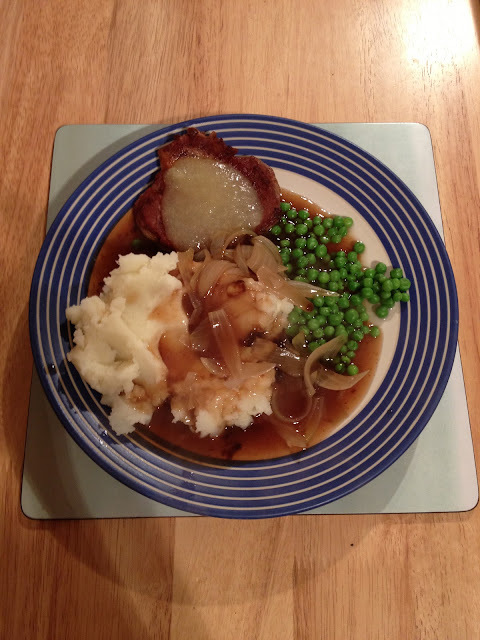 That's a pork shoulder steak on the plate too, which cost 75p and we needed apple sauce too. But, a very tasty meal which doesn't cost much and little effort in cooking is the best one in my book. That looks like a perfect dinner. Good wholesome food. I agree. Weekday dinners should be quick and simple. The weekends are for pottering around in the kitchen creating culinary masterpieces. Today's a fast day so we had chicken and haricot beans in a lemon and rosemary sauce. Sounds complicated by it was a doddle - a tasted delicious.